Notice is hereby given that the 1st Annual General Meeting of the Company will be held on Thrusday the 14th June, 2017 at 11.00 A.M. at the Registered office of the Company, ______________________________________ to consider and if thought fit, to pass with or without modifications, the following resolutions. 1 To receive, consider and adopt the audited Balance Sheet of the Company as at 31st March 2017 and The Profit and Loss Account for the period ended on the said date, along with the Report of the Directors and Auditors thereon. 2 To appoint Auditors to hold office from the conclusion of the this Annual General Meeting till the conclusion of the next Annual General Meeting and to authorize the Board of Directors to fix their remuneration. M/s Lala Sons & Associates Chartered Accountants, Lucknow, retire and are eligible for re-appointment. 1 A Member who is entitled to attend and vote at the meeting is entitled to appoint proxy to attend and vote instead and such proxy need not be a member of the Company. Proxy in order to be effective must be deposited with the Company not less than 48 hours before the meeting. Your Directors have pleasure in presenting the 1st Annual Report and Audited Accounts of the Company for the year ended 31st March, 2017. Your Company is Registered in West Bengal State with Registrar of Companies having Certificate of Incorporation with Corporate Identity No.U454490UP455PDC123454. There were no transactions transacted during the period under review. As there were no operations carried out during the period under review, no comments can be made for the same. During the year under review no Additional Directors were appointed. M/s. Lala sons & Associates., Chartered Accountants, Mysore, auditors of the Company, retire at the conclusion of the ensuing Annual General Meeting and have expressed their willingness to act as auditors of the Company, if appointed, and have further confirmed that the said appointment would be in conformity with the provisions of Section 224(1B) of the Companies Act. The observations of the Auditors in their Report on Accounts read with the relevant notes are self-explanatory. During the year under review, your Company has neither invited nor accepted any deposits from the public. (iv) That the Directors have prepared the accounts for the financial year ended 31st March, 2017 on a ‘going concern’ basis. As per Section 383A of the Companies Act, 1956 the Company has complied all the relevant laws with respect to Secretarial Compliance. Your Directors acknowledge the continued support and co-operation from the Banks, and Government Authorities during the year under review. Further your Directors thank the Shareholders for their continued confidence in the Company. 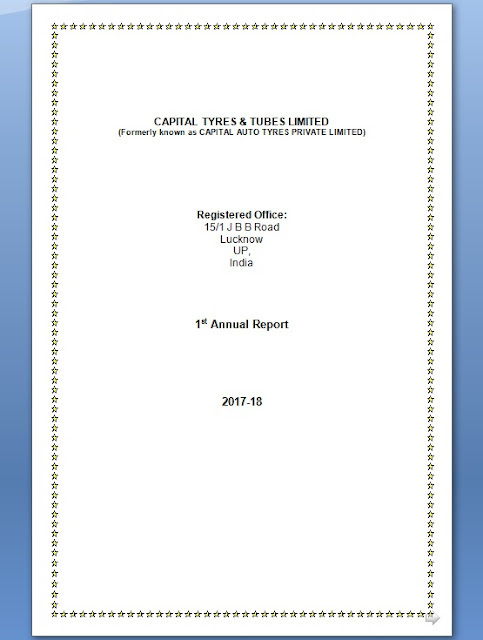 I have audited the attached Balance Sheet CAPITAL Tyres & Tubes Limited, as at March 31, 2017, and the Profit and Loss Account for the year ended on that date annexed thereto, which I have signed under reference to this report. These financial statements are the responsibility of the Companies management. My responsibility is to express an opinion on these financial statements based on my audit. I conducted my audit in accordance with the auditing standards generally accepted in India. Those Standards require that plan and perform the audit to obtain reasonable assurance about whether the financial statements are free of material misstatement. An audit includes examining on a test basis, evidence supporting the amount and disclosures in the financial statements. An audit also includes assessing the accounting principles used and significant estimates made by management, as well as evaluating the overall financial statement presentation. I believe that my audit provides a reasonable basis for my opinion. As required by the Companies (Auditor's Report) Order, 2003 and as amended by the Companies (Auditors Report) (Amendment) Order, 2004, issued by the Central Government of India in terms of sub-section (4A) of section 227 of the Companies Act, 1956 of India (the Act) and on the basis of such checks of books and records of the company as I considered appropriate and according to the information and explanations given to us, I comment that as the Company has not commenced any business activity the report on the same is not applicable. vi) In my opinion and to the best of my information and according to the explanations given to us, the said financial statements together with notes thereon and attached thereto gives in the information required by the Act, in the manner so required and give a true and fair view in conformity with the accounting principles generally accepted in India. b) in the case of the Profit and Loss Account, of the Loss for the year ended March 31, 2012. The financial statements are prepared in compliance with Indian Accepted Accounting Principles (GAAP) under the historical cost convention on the accrual basis. The management evaluates all recently issued or revised accounting standards on an on going basis. The preparation of financial statements in conformity with GAAP requires the management to make estimates and assumptions that affect the reported balances of assets and liabilities and disclosures relating to contingent assets and liabilities as at the date of the financial statements and the reported amounts of income and expenses during the same period. Sales are accounted for on passing of title to the customers. Returns and rebates and discounts against goods sold are recognised as and when ascertained and deducted from sales. Sales include excise duty. Export benefits arising on account of entitlement for duty free imports are accounted for at the time of receipt of material. Other export benefits are accounted for as and when accrued. Fixed Assets are stated at cost of acquisition / construction (net of CENVAT/VAT and other credits) or at revalued amount as the case may be and inclusive of incidental expenses, erection / commissioning expenses, revamping expenses, pre-operative expenses, interest, etc. upto the date the asset is put to use. Long Term Investments are valued “at cost” except where there is a diminution in value, other than temporary, in which case, adequate provision is made against such shortfall. Inventories are valued at lower of cost or estimated net realisable value. Expenses are accounted for on accrual basis and provisions and mad for all known losses and liabilities. Not Applicable, as the Company is yet to commence any business.